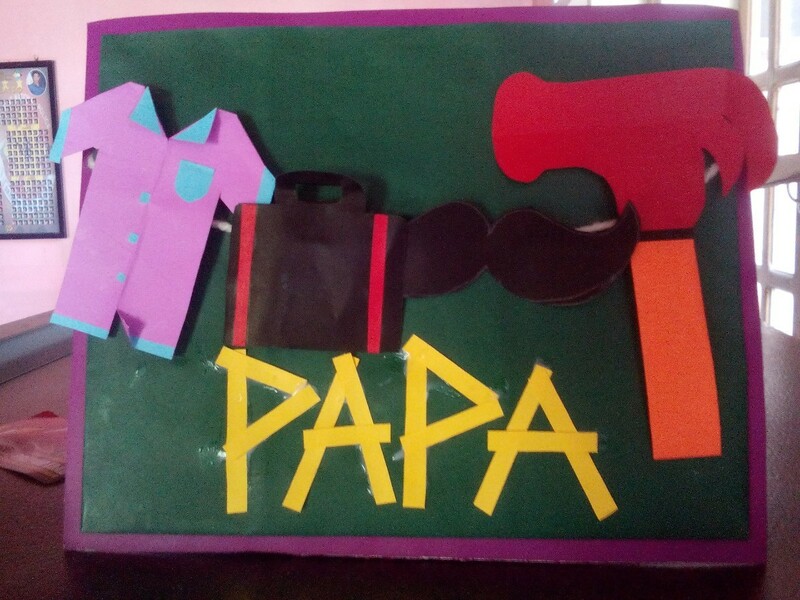 What father wouldn't love to get a homemade card on Father's Day. This is a guide about homemade Father's Day cards. I recently discovered some old family photos in my mother's cupboard. The photos are more than 50 years old, and all of them are coming from the era when black and white photos were still regarded as fashionable. When I looked at these photos, I immediately thought of all the craft projects that these photos could be used for. I decided to use one of these photos to make a birthday card for my father. 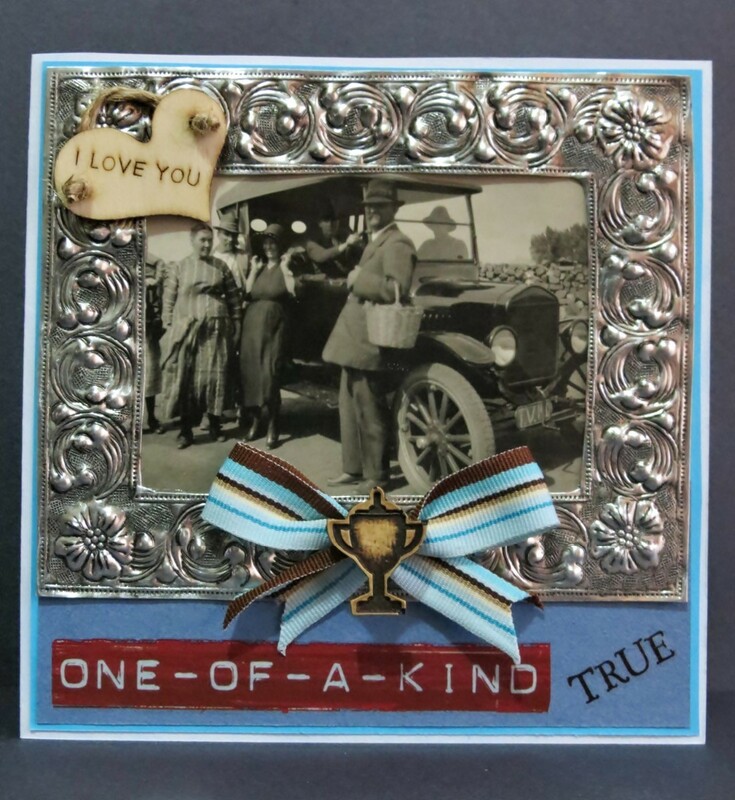 This card can also be adjusted for Father's Day, or any other occasion when you would like to make a card for a man. a suitable old black and white photo. *I used PhotoScape version 3.5, which can be downloaded free of charge from http://www.photoscape.org/. Fold tan cardboard in half to create a card 4.1 x 6 inches. Use the ruler to make the fold neat and smooth. Cut the two shortest sides of the dark brown cardboard with the pair of pattern edged scissors. Glue the 3.6 x 5.6 inch dark brown cardboard to the front of the card, carefully ensuring that it is an equal distance from the edges. Scan the photo onto your computer. With the PhotoScape program, add an antique photo filter (nr 4). This will turn the color of the photo into sepia, and also give it an aged look. From the different frames that could be added to the photo, choose the Paper01 frame and set the width at 200%. Save the adjusted photo onto your computer. If you want to keep the scan of the original photo for another project, remember to save the adjusted photo under a different name. 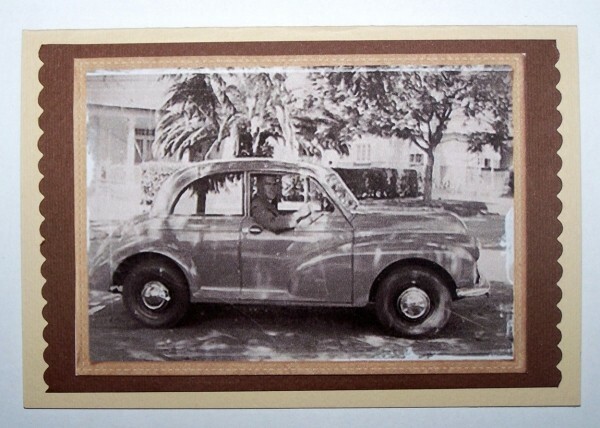 Print the photo and then glue it to the front of the card, again ensuring that it is an equal distance from the edges. Print a message on the beige paper, cut it to the correct size and paste it to the inside of the card. Note: If you can't find a matching envelope, use a light tan sheet of paper and make your own envelope. You can find some templates for envelopes at: http://desktoppub.about.com/library/weekly/xenvtemp.htm. Editor's Note: You will want to measure your photo choice and adjust card and envelop sizes accordingly. With Father's Day just around the corner, here is a themed card for a chess-loving father. 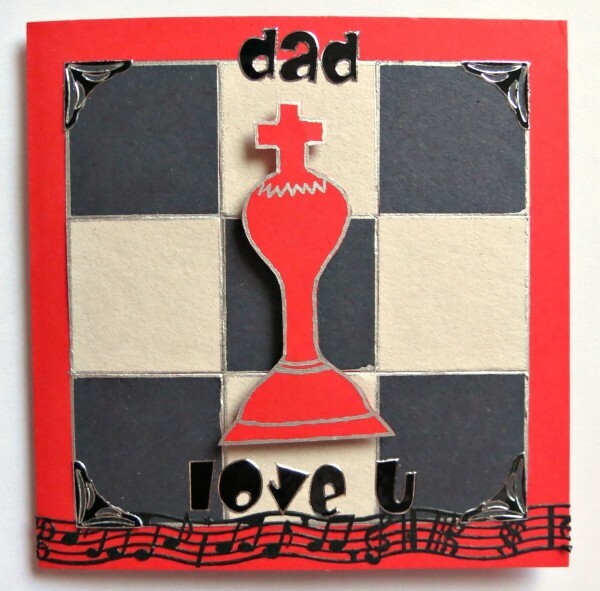 The focus point of the card is a king chess piece, reminding your father that he is the king of your heart. The card requires a few simple materials, but the end result is very pleasing and should speak right to your father's heart. Checkmate! Cut a piece, sized 10" x 5", from the red cardstock. Score it in half to create a card sized 5" x 5". From the black sugar paper, cut five 1.3" squares, and cut four 1.3" squares from the white sugar paper. 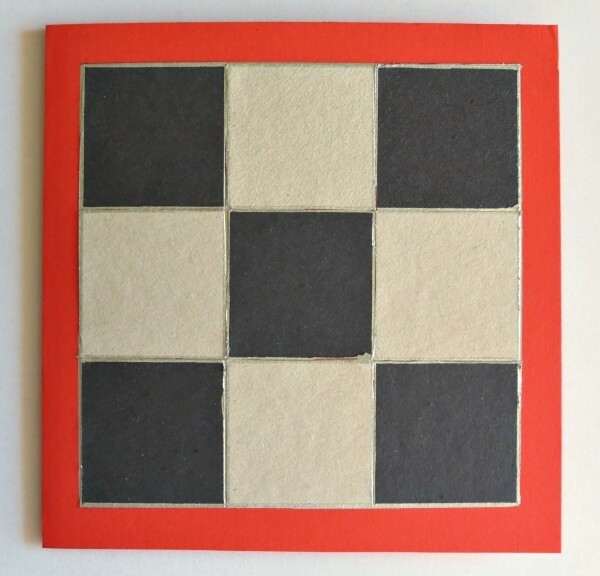 Glue the sugar paper squares to the front of the card to make a partial chess board. Use the Pilot silver marker pen to highlight the lines between the squares. 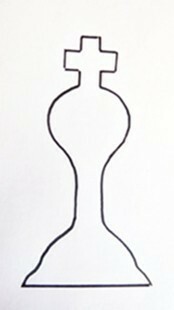 Also draw a silver frame around the partial chess board. 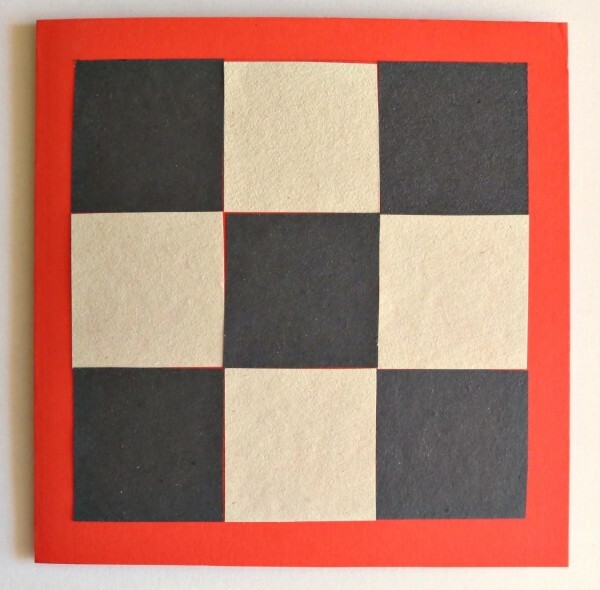 Trace the pattern of the chess piece onto the remaining red cardstock and cut it out. 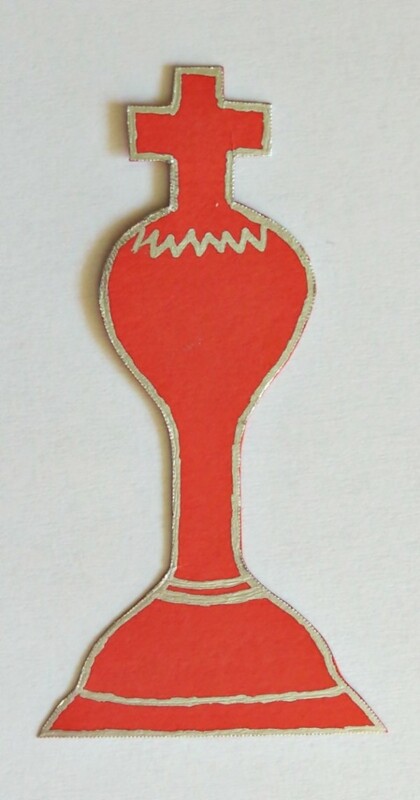 Add a silver border around the chess piece. Also add some detail to the chess piece. 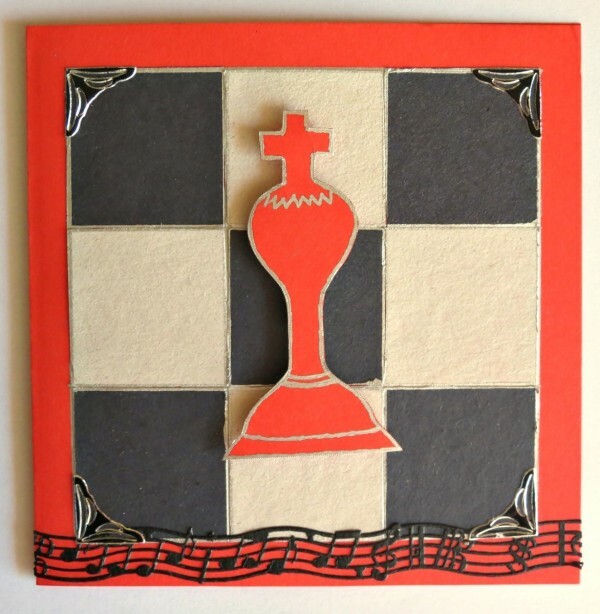 Use self-adhesive foam squares to affix the chess piece to the front of the card. Add a strip of musical notes lace tape to the bottom of the card and cut off any protruding edges. Add the four photo corners to the partial chess board. Use the alphabet stickers to spell "dad" at the top and "love u" at the bottom of the card. 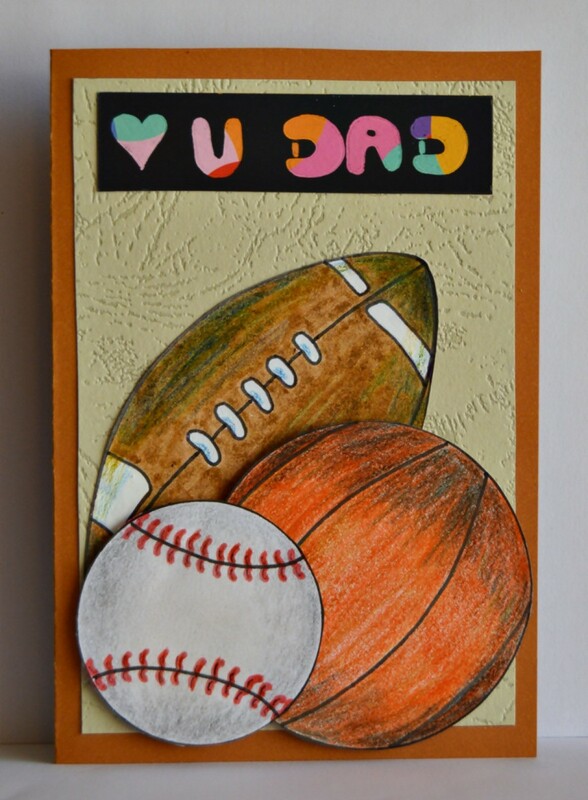 Show Dad how much you appreciate him with a handmade card that is sure to make him smile. 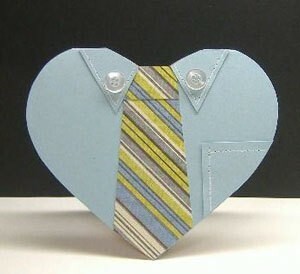 This gorgeous heart-shaped card uses cardstock, decorative paper, buttons and a faux stitch technique. Father's Day is the one day in the year when you can show your father how much he means to you. There is no better way of telling him that he is a one-of-a-kind dad than with this card. An easy and cute Father's Day card idea for kids. Father's Day is the one day in the year when you can tell your father that he is your hero. 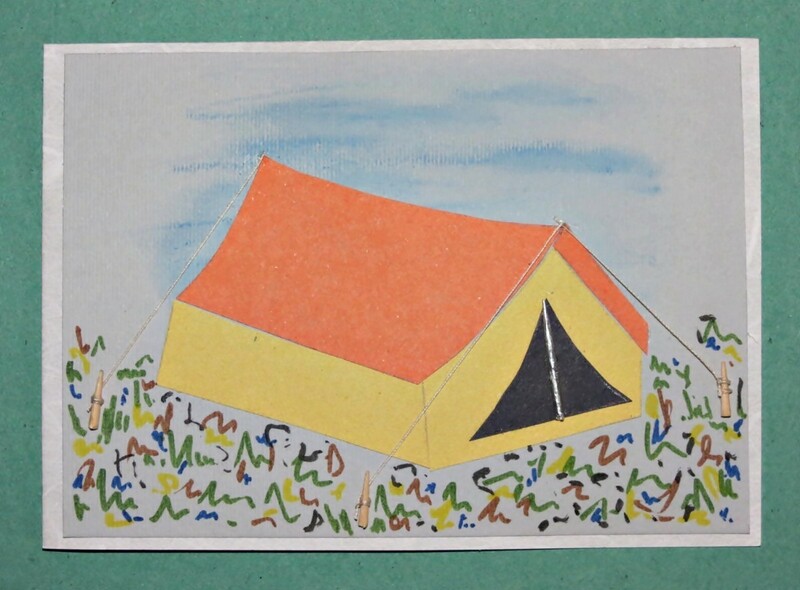 Make this card to remind him of your last camping trip. An excellent way to thank him for quality time spent together in the outdoors. 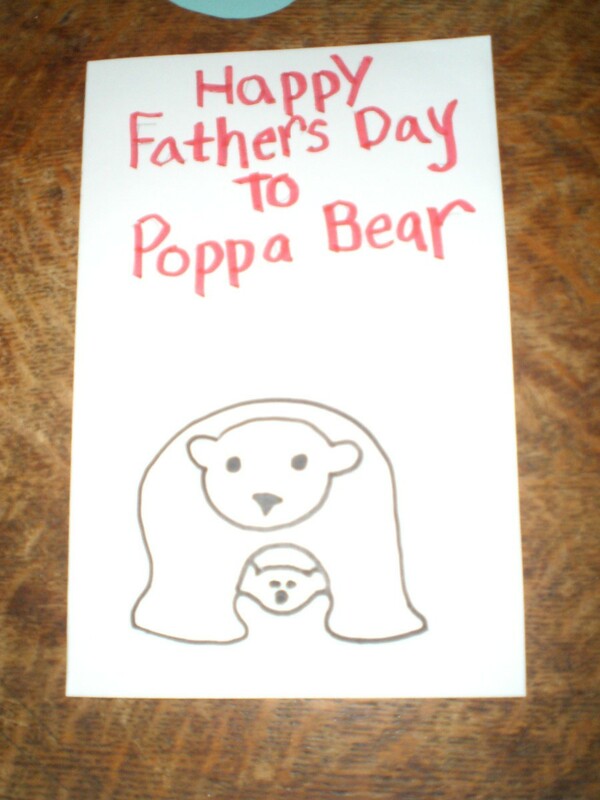 Here's a simple and fun Father's Day card that even the youngest children can make. The center of the flower can be decorated with sequins, small seeds, or a photo. This is the perfect card for the father who has everything or an older parent. The pocket on the shirt makes a handy money holder. 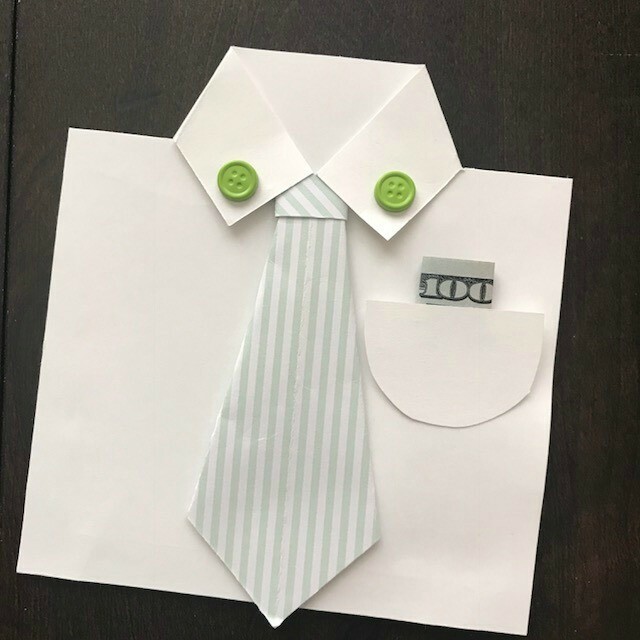 This is a guide about how to make a Father's Day shirt and tie money holder card. 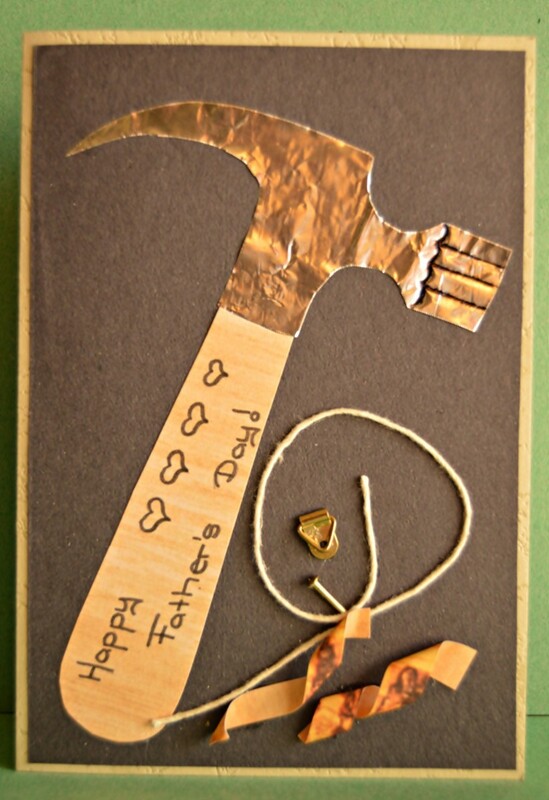 This is a guide about making a Tools for Father's Day card. This clever card is perfect for the do-it-yourself dad on his special day. 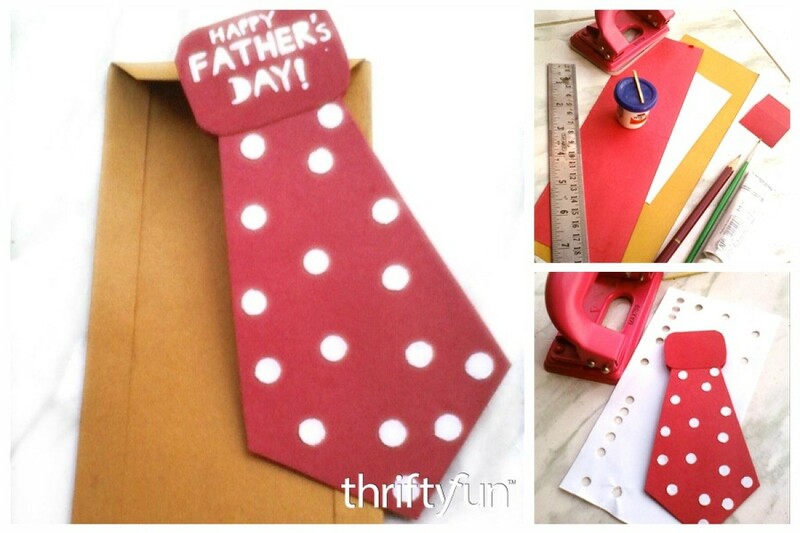 This is a guide about making a necktie Father's Day card. Homemade cards can often be a gift in themselves. This sweet project highlights all the ways your father is unique and special. It would be perfect for a birthday or for Father's Day. This guide has instructions for making a describing my Dad card. 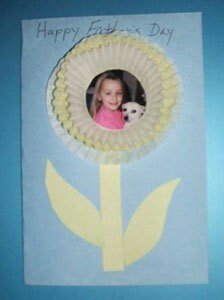 A homemade card for special occasions such as Father's Day or a birthday can be a gift in its own right. This one is especially good for a dad that enjoys sports. This is a guide about how to make a "Love U Dad" card.